1. Peel and cut the potatoes into 3cm chunks. Place in a large saucepan and add a big pinch of salt. Cover with water and place over high heat. Bring to the boil then reduce the temperature and allow to bubble gently for 10-15 minutes or until potatoes are tender. Drain and put potatoes back into the saucepan. Set aside. 2. Heat a large shallow pan over medium high heat. Add 1 tbs of olive oil and then the sausages. Cook the sausages until browned on all sides. Remove and set aside. 3. Add the remaining olive oil to the pan and add the onion, bay leaf and thyme. Season with S&P. Cook stirring until onion is soft. Add the garlic and cook for a minute or two, stirring. 4. Increase the heat to high. Add the chicken and cook stirring occasionally until browned and sealed. Add the bacon and stir to combine. Cook for a few minutes, stirring occasionally. 5. Add the tomatoes, stock and sugar to the pan. Stir to combine. Return the sausages to the pan. Bring to the boil then reduce the temperature to medium and allow to bubble gently for 10-15 minutes, stirring occasionally. 6. Preheat oven to 200C Fan Forced. 7. Meanwhile mash the potatoes roughly. Place over low heat and add the butter and the milk. Season very well with S&P. Mix well to combine but keep some lumps in the mix. Remove from the heat and stir in the cheeses, chives and flour until it just comes together to make a lumpy dough. 8. When the cassoulet sauce has thickened add the beans and their juice. Stir to combine. Divide the mixture into 4 individual pie tins or large ramekins. 9. Form heaped dessert spoonfuls of the dough into dumplings. Place them on top of the dishes, dividing equally if you can. 10. Place pie tins onto a tray and bake in the centre of the oven for 15-20 minutes or until dumplings are golden brown and cooked through. 11. Remove and rest for 10 minutes before serving. *Cassoulet can be made in advance and stored in the fridge for up to 3 days. 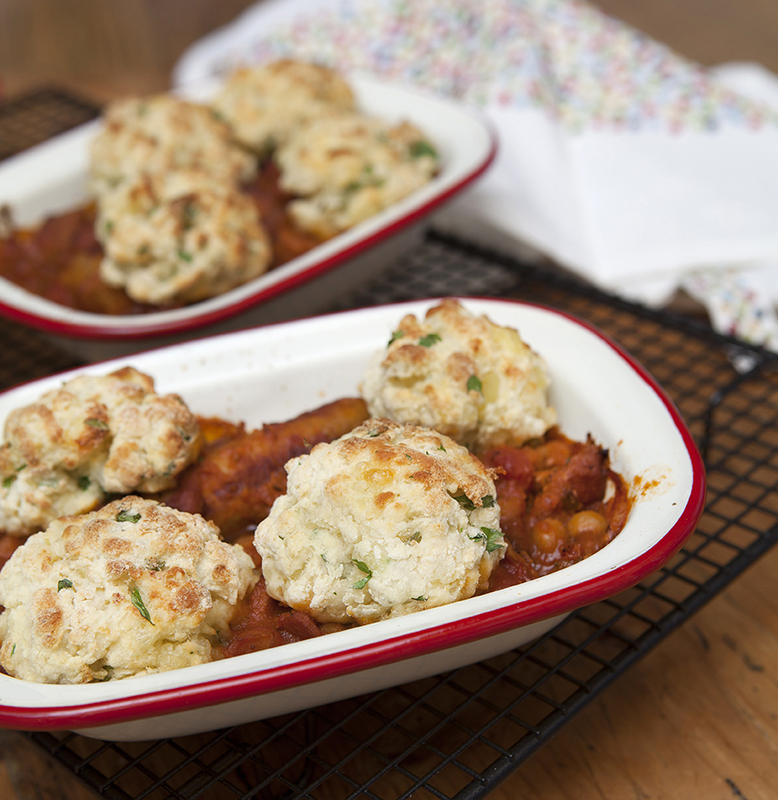 To serve make the dumplings and add to the cassoulet then bake as directed from step 10.